For those of you who don’t know about CrunchBase (@crunchbase), it is a crowdsourced database of information about startups, people and investors. Crunchbase describes themselves as “the free database of technology companies, people, and investors that anyone can edit. Our mission is to make information about the startup world available to everyone and maintainable by anyone.” AOL acquired Crunchbase and TechCrunch in 2010 from Michael Arrington. Crunchbase has been very successful in sourcing data, and have established strong relationships with many of the leading venture capital firms who regularly share data about their portfolio companies (fundraising, people, etc.). CrunchBase has even developed an Excel Data Exporter, in addition to its API access, to allow for the broader distribution of the information contained in its databases. We provide access to portions of the Site and Service through an API thereby enabling people to build applications on top of the CrunchBase platform. For purposes of this Terms of Service, any use of the API constitutes use of the Site and Service. You agree only to use the API as outlined in the documentation provided by us on the Site. On any Web page or Application where you display CrunchBase company or people results, each page must include a hypertext link to the appropriate company or person profile Web page on CrunchBase.com. Additional CrunchBase Branding Requirements can be found on the following Web page: http://info.crunchbase.com/docs/licensing-policy/. CrunchBase may grant exceptions on a case-by-case basis. Contact us atlicensing@crunchbase.com for special branding requests, which must be approved in advance in writing. CrunchBase will utilize commercially reasonable efforts to provide the CrunchBase API on a 24/7 basis but it shall not be responsible for any disruption, regardless of length. Furthermore, CrunchBase shall not be liable for losses or damages you may incur due to any errors or omissions in any CrunchBase Content, or due to your inability to access data due to disruption of the CrunchBase API. CrunchBase reserves the right to continually review and evaluate all uses of the API, including those that appear more competitive than complementary in nature. CrunchBase reserves the right in its sole discretion (for any reason or for no reason) and at anytime without notice to You to change, suspend or discontinue the CrunchBase API and/or suspend or terminate your rights under these General Terms of Service to access, use and/or display the CrunchBase API, Brand Features and any CrunchBase content. For those of you who are not aware, the CC-BY license type is a very broad license grant – providing for the “maximum dissimentation of licensed materials”. You can find the existing CC license types here and specifically the summary of CC-BY license. Pro Populi, a small three person startup, has been developing applications utilizing the CrunchBase dataset, one app called People+. Pro Populi has apparently been accessing the CrunchBase data (originally via the API, but also through other means apparently) to populate their own database of content and then accessing that content (and other content) from their applications. Wired (@Wired) reporter David Kravets (@dmkravets) broke the story on November 5th in a story titled AOL Smacks Startup for Using CrunchBase Content It Gave Away. If you click through the link to the original Wired article, you can review some of the correspondence gathered by David Kravets in support of the story. On the chance that you may have misinterpreted Matt’s willingness to discuss the matter with you last week, and our reference to this as a ‘request,’ let me make clear, in more formal language, that we demand that People+ immediately cease and desist from its current violation and infringement of AOL’s/TechCrunch’s proprietary rights and other rights to CrunchBase, by removing the CrunchBase content from your People+ product and by ceasing any other use of CrunchBase-provided content. But if CrunchBase didn’t want to allow others to use the data, why does it license its content under the CC-SA scheme? Hopefully CrunchBase and Pro Populi can come to an agreement which works for both of them and their interests. While CrunchBase can likely legitimately claim to restrict access to their content via their API (licensed separately, not covered by the CC-SA scheme, and with separate terms), once content covered by the CC-SA license has been accessed and copied in a manner consistent with CC-SA, can CrunchBase assert rights to “get it back?” That seems to be an incredibly difficult road to hoe, and inconsistent with the very broad terms of the CC-SA license grant. Worse yet, according to the Wired article, the General Counsel of the Creative Commons Corporation doesn’t think so. The Electronic Frontier Foundation represents Pro Populi. CrunchBase could have stayed within the CC license scheme and chosen a different CC license type for the underlying data – including one which specifically prohibits the use of the content for commercial purposes, which prohibits the creation of derivative works, and which requires specific attribution to them. That license type is CC BY-NC-ND. On a case by case basis they could have authorized/waived the restrictions contained in the license. CrunchBase could have also changed the license grant for content accessed via the API. This is solvable. For an interesting view of this dispute from TechCrunch (a sister company to CrunchBase), see their take on the dispute. Impact On Other “Hybrid” Commercial Use of Crowdsourced Data? While CrunchBase and Pro Populi resolve their dispute, I am most interested in thinking about how this potentially impacts other crowdsourced data platforms and the applications built on top of them. It is an interesting dilemma and question – how can/should crowdsourced data platforms be able to commercially benefit from their efforts – including restricting other potential competitors from a copying of data for their own purposes – commercial or otherwise? Sourcing, filtering, vetting, editing, organizing, etc. hundreds, thousands and millions of data points is a complex undertaking. It takes time, effort, people and ultimately money. Unless that vetting is also done from a crowdsourced perspective (or mostly so – like the Wikipedia model), allowing potential competitors (commercial or otherwise) to copy that structured content is a potential death knell. In that instance, openness needs to be balanced against a commercial purpose. CrunchBase President Matt Kaufmann blogged about the CrunchBase dispute with Pro Populi and the EFF. He essentially acknowledges the challenge of openness in the context of trying to build a commercial business – but re-affirms his belief that CrunchBase thought they restricted the use of their data (via the API or otherwise) for commercial purposes under their current licensing terms. [T]o invest in CrunchBase’s constant improvement requires building a business around CrunchBase in a way that successfully takes into account our terms of service and our openness. We are confident that this is possible, and that’s what we are on the path to figuring out. This is of course the challenge – adding enough value in the stack above the “open” content that can be commercialized. As an example, take a look at MapBox – MapBox is a cloud-based platform which allows for developers to embed geo rich content into their web and mobile offerings. They recently took $10M from Foundry Group, and I blogged about that investment – MapBox, Geo Software Platform, Maps $10M from Foundry Group. MapBox relies on data sourced from OpenStreetMap, the “free wiki world map.” OpenStreetMap licenses its content in two ways – the underlying data is licensed as open data under the Open Data Commons Open Database License (ODbL) while the cartography and documentation are licensed under the CC BY-SA license, the same license selected by CrunchBase). BTW, Kevin Scofield likes the MapBox interface too. It would be a difficult commercial business model indeed for MapBox to go through the effort of building an infrastructure to help source, collect and organize all kinds of mapping data, which was open for other uses, as well as building an application layer on top of it. MapBox instead focuses on creating a great platform layer on top of the otherwise “open” content (others are free to do so as well). This model works because there is enough community interest to support an undertaking like OpenStreetMap to begin with. Can the same be said for the data underlying CrunchBase? Gartner concludes that both 3D printing and scanning are 5-10 years away from their Plateau of Productivity, i.e., the time when mainstream production starts to take off. While it is certainly debatable at what point the democratization of 3D capture and production technologies will unlock mass customization and the concept of a “personal factory,” 3D printing and scanning tools are being used productively right now in a wide range of businesses. Of course, I know this since Geomagic is a key player in this space, and our software is used to support many production processes in conjunction with our various 3D scanning and printing partners. It’s not hype; it’s reality. In context, then, for many applications, 3D scanning and printing technologies are already at the Plateau of Productivity. It’s easy for a research analyst, writer, blogger, industry pundit or other predictor of ominous events to throw cold water on innovation and creativity. But the question remains, how does hype transition to a market- and game-changing shift that impacts the way people live and work? History is littered with innovators and innovations that wouldn’t fit neatly into a Hype Cycle curve and wouldn’t give way to the nearsighted individuals and companies blind to the changing world (and unable to adapt, pivot and embrace the change). Innovators and innovations fly in the face of market research, design panels and peer reviews. They believe when no one else does. Intel’s Andy Grove added, “We were exposed to Apple’s early products, and I could not imagine anything except trivial applications for that.” When commenting on the rise of the personal computer, he thought it would only be good for storing recipes, the irony being that the PC would be the biggest consumer product, by far, for Intel. Click here for more information. HP and others are glad they didn’t listen to market pundits who said home printers would never be a big market. Later, considering the turn toward digital information, they predicted doom again. Why would people continue to print things? Turns out personal printing has continued to grow because, interestingly, even in the digital world, people like to print things, like photographs. I’d say that a couple billion personal printers sold over the years makes the category pretty successful. Kodak didn’t react quickly enough to consumer shift from film to digital camera solutions. Accordingly, they missed a huge market opportunity in favor of defending the company’s film consumables and processing business. Let’s not forget the same can be said for the iPad, but in that case others had (unsuccessfully) done it before. “Nintendo must be looking backward, thinking that history is going to repeat itself, over and over again. Sorry guys, the rest of us are looking for improvement. Hence why the other two 7th generation systems are so visually appealing with improved graphics and HD/Blu-Ray options. Colorful bubbly shaped characters are for little children and cartoons.” – From the www.wiisucks.com website. Sure, there are plenty of failures and examples that fit into a hype cycle. For example, you certainly wouldn’t want to be the Dutch tulip grower who, on April 26, 1637, paid “two wagon loads of wheat, four loads of rye, four fat oxen, eight fat swine, twelve fat sheep, two hogheads of wine, four barrels of beer, two barrels of butter, 1000 pounds of cheese, a marriage bed with lines and a sizeable wagon” for one tulip bulb. Likewise, Betamax, despite being better technically, lost out to the VHS format. But even in the face of failure, I’ll bet the innovators, like the Betamax engineers at Sony, believed up to (and even past) the bitter end. I bet they still believe that theirs was better. For those of you who know me, I am a fairly conservative guy in many areas. In a self-assessment I’d say my skill set is more in tune with execution rather than pure innovation. I was prroud to work at a company that is focused on this space and powered by a team of passionate, creative individuals. 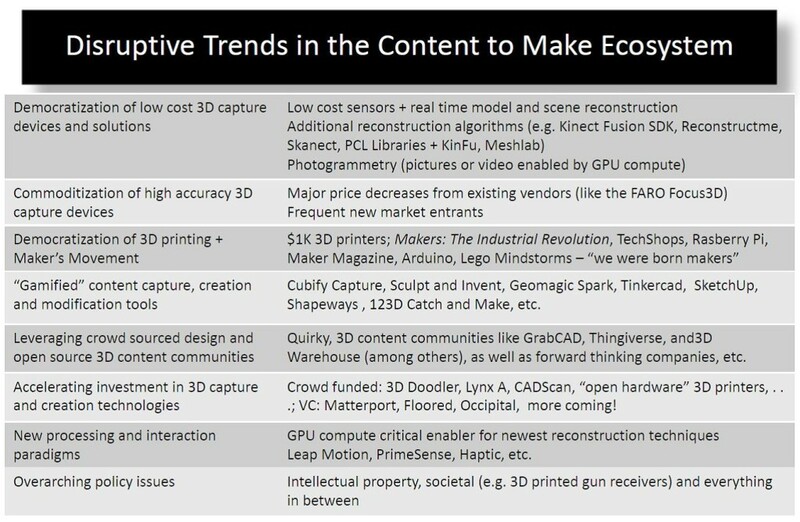 Ultimately, I could be proven wrong in my belief that the democratization of reality-capture technologies, interaction tools and 3D printing devices will shift the market and change our very lifestyles beyond the manufacturing ecosystem that already profitably leverages these technologies. But even if I’m wrong, I’ll still believe. The $40 (or $20) million helmet. Or not. Andrew Ainsworth thought that he was doing nothing wrong. In 2002 he started selling helmets and body pieces from Stormtrooper uniforms to help cover schooling costs. He had previously done work for Lucasfilm and helped to create the original Stormtrooper costumes for the Star Wars film. He had been asked by George Lucas at Elstree Studios to make a prototype based on original drawings from Ralph McQuarry. After two days and a prototype Lucas allegedly ordered 50. When a helmet and a few other pieces pulled in nearly $100,000 for a sale at Christie’s he knew he was on to something. He dug out the old molds and started selling them. After roughly 20 had been sold in the United States, someone else noticed – namely Lucasfilm. Lucasfilm sued Shepperton Design Studios Limited, and Andrew Ainsworth, in the United States District Court for the Central District of California on May 6th 2005. The complaint alleged that Mr. Ainsworth had violated Lucasfilm’s copyrights in their Stormtrooper and TIE fighter pilot characters as well as Lucasfilm’s “Imperial” logo trademark. Plaintiff alleges that Defendants copies Plaintiff’s copyrighted artwork and Plaintiff’s fanciful characters in Plaintiff’s 1977 Star Wars Film, that Defendants prepared three-dimensional copies of Plaintiff’s depictions, that Defendants publicly distributed those copies and that Defendants also publicly display them on Defendants’ website, all without Plaintiff’s consent. In September 20th 2006 the United States District Court granted a default judgment to Lucasfilm and awarded in excess of $40 million1 in damages (for $5M for copyright, $37.5M for trademark infringement as well as an award of attorney’s fees). But there was more than a little problem. Because Mr. Ainsworth had no assets in the United States, Lucasfilm had to take their judgment to the UK courts for enforcement. Lucasfilm wanted to enforce the award in the UK, and so it went to enforce its judgment. Seems simple right? Lucasfilm owned a valid copyright in the artistic/sculptural StormTrooper uniforms, Ainsworth violated it by creating copies or derivative works, and he was not authorized to do so. Open and shut case, right? Something strange happened in the U.K. courts. First, lower courts held that Lucasfilm couldn’t enforce the California judgment. They also found that uniforms and helmets were not protectable by copyright because they were not sculptures — and even though they were copies Ainsworth had other defenses – all of Lucasfilm’s claims in the U.K. courts were dismissed. Then the U.K. Supreme Court took up consideration of the case and handed down a fairly surprising ruling. On July 27th, 2011 they upheld the lower court rulings that the Stormtrooper uniforms were not in fact artistic or sculptural elements protectable by copyright, but instead, they were utilitarian and functional objects because they were a necessary element of the film that was being produced. They were a “mixture of costume and prop.” As a result, they were not protectable by copyright. They did this while also resolving an outstanding controversy of whether U.K. courts could decide if non-U.K. copyrights had been infringed. The U.K. Supreme Court got it wrong. While you can’t help to personally feel for Mr. Ainsworth in his battle with Lucasfilm, the logic is twisted in achieving their desired result. For the U.K. Supreme Court’s analysis on why the uniform and helmet were not “sculptures” under U.K. law, see the discussion starting at Section 28 in the Court’s opinion. Much of the discussion and focus is to the particular production methods used to make the helmet and uniform rather than what is really at the heart of the matter – is it artistic or creative however created? Read it and form your own opinion. Lucasfilm issued a statement after the U.K. Supreme Court ruling stating in part that the ruling “maintains an anomaly of British copyright law under which the creative and highly artistic works made for use in films – which are protected by the copyright laws of virtually every other country in the world – may not be entitled to copyright protection in the U.K.” I agree. Disagreeing with the U.K. Supreme Court’s conclusion doesn’t take away from the fact that it is valid law in the U.K. If the frame of reference is a fantasy or virtual world, or a movie, or even perhaps a play, props are absolutely functional – they are required to produce or deliver the creative work. In that context, a Stormtrooper helmet is “functional.” Outside of that frame of reference (i.e. the real world we live in) individual elements appear to be distinctive, creative works in their own right. Outside of the Star Wars film universe – who can really deny or argue that the uniforms and helmets were creative and therefore protectable? How would the U.K. courts ruled if the helmets and uniforms in question had not been used in a movie? Quite differently I suppose. So there we have it. The same Stormtrooper uniform. The same helmets. Completely different conclusions. A United States court finds that they are protectable by copyright and awards millions in dollars of damages. The U.K. Supreme Court finds that they are not protectable by copyright. Uh oh. What is truly interesting is to consider how this ruling will apply to objects which might be reproducible by 3D printers – particularly as it relates to elements used in films or live stage productions. For example, the “cube” in the Super8 film might be viewed as content protectable by copyright in the United States but in the UK viewed as utilitarian (because a necessary element of the film it was used in). http://www.supremecourt.gov.uk/docs/UKSC_2010_0015_Judgment.pdf (the U.K. Supreme Court Judgment in Lucas Films Limited and others (Appellants) v. Ainsworth and another (Respondents) – all forty glorious pages of it! 1 It is worth noting that in various press articles, as well as the UK opinions, that the damage award under the Default Judgment was $20 million. This is incorrect. On the Lahnam Act (trademark) claims the court awarded $2.5 million in license fees and $10 million for damage to reputation and goodwill and then tripled those damages. This would result in $37.5 million for the Lanham Act claims alone. This blog was originally published on May 24th, 2012. This blog was originally posted on March 22nd, 2012.